Can a Turtle Pull Its Whole Body in Its Shell at Once? Turtles carry some of the most effective armor in the animal kingdom; when confronted by a predator, many will pull their heads, tails and limbs inside their shells at once. However, many turtles have reduced shells that cannot contain their bodies, and some have entirely lost the ability to retract into their shells. Such species generally rely on other forms of protection, such as speed, size or formidable jaws. Most turtle shells have similar design and construction. Small bony plates called dermal bones grow in the skin and fuse with the turtles’ rib cages. Unlike those of most other vertebrates turtles' hips and shoulder girdles reside inside their rib cages. Most turtles have keratinized scutes on the outside of their shells, though some -- including soft-shelled (Apalone spp.) and sea turtles -- have leathery shell surfaces. Several turtle lineages have evolved hinges on their plastrons or carapaces, which affords them even greater security than their non-hinged relatives have. After pulling their extremities into their shells, the turtles use the hinge to seal their shells tightly. In such turtles, none of their extremities remain visible when the hinge is in the "closed" position. Various lineages have hinges in different locations. North American box turtles (Terrapene spp.) have hinges on the fronts of their plastrons, while hinge-backed tortoises (Kinixys spp.) have hinges on the posterior sides of their carapaces. Some turtles have shells that cannot contain their limbs, heads or tails; such species cope with this in various ways. 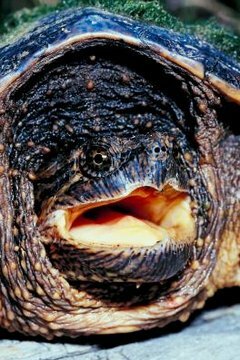 Snapping turtles (Chelydra serpentine), alligator snapping turtles (Macrochelys temminckii) and softshell turtles (Apalone spp.) all have very reduced shells, leaving them somewhat vulnerable. They offset this by protecting themselves with their powerful jaws. The shells of sea turtles do not function like the shells of freshwater species do; these turtles cannot withdraw into their shells at all. Instead, they protect themselves through a combination of size, speed and agility. Herpetologists group all 325-plus living turtle species into two groups: those that retract their heads by folding them vertically and those that retract their heads by folding them up in a lateral manner. Most turtles, including all North American species, are of the former type; they form the suborder Cryptodira. The word literally means "hidden necks." Most cryptodires appear to pull their heads straight back into their shells, though a few groups -- notably sea turtles -- have lost the ability to retract their heads at all. Only 66 living species represent the other primary group of turtles, the pluerodira or "side neck" turtles, and most of these live in South America, Australia and Africa. These species often bear colloquial names, such as snake- or long-neck turtles, in reference to their unusually long necks that fold back awkwardly into their shells. Can Turtles Retract Their Head & Legs Into the Shell? How Does a Shell Help to Protect Turtles? How Do Tortoises Retract Their Heads? How Are Lizards & Snakes Alike? What Does the Silver Dollar Turtle Look Like?